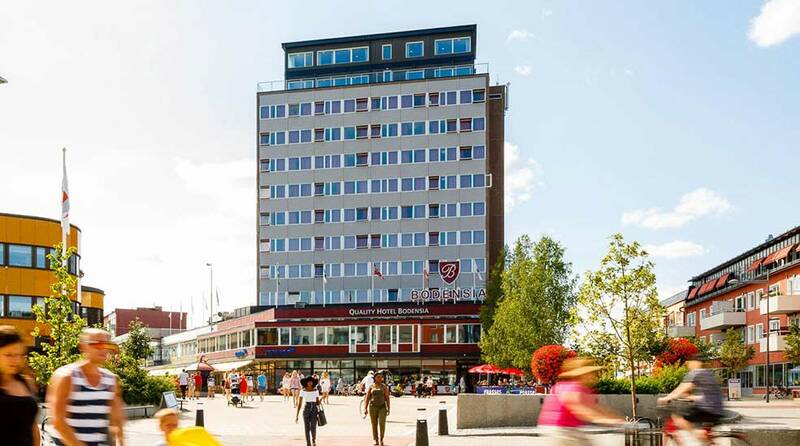 Welcome to Quality Hotel Bodensia, a business and conference hotel in the heart of Boden. A modern and welcoming city hotel perfect for travellers who appreciate quality and practicality. There's a shopping centre, cultural services and jogging track all within easy reach, and thanks to the hotel's 11 floors there's always a fantastic view to be had as well as a warm atmosphere and first-class service. Quality Hotel Bodensia is located next to Enter Galleria, which is Boden's largest shopping centre. Here there are about 15 shops, with everything from independent shops to large chain stores. In other words, you don't even need to leave the building – it's all here! Conferences, courses, seminars or kick-off meetings, there are plenty of reasons to meet outside the work place. Quality Hotel Bodensia has five well-equipped conference rooms in different sizes, which are the perfect setting to inspire creative expression and innovative thinking. More information about our conference opportunities here . If you're visiting Boden with your family or friends, there's plenty of fun activities just a stone's throw from the hotel including the shopping centre, Military Museum, water park or Western Farm amusement park, to name but a few. Come and ask us for our favourite tips on what to do – we know Boden inside out. The best way to end a long and eventful day is in our relaxation area on the 10th and 11th floors. The floor has five saunas, all of which have fantastic views of the former garrison town of Boden and its surroundings. Here you can relax with someone special, chat about the conference, or unwind together with the whole family. Bus stop: Medborgarplatsen or Kvarnängen. Bus or airport taxi to the hotel. or Minicab +46 921 640 00.